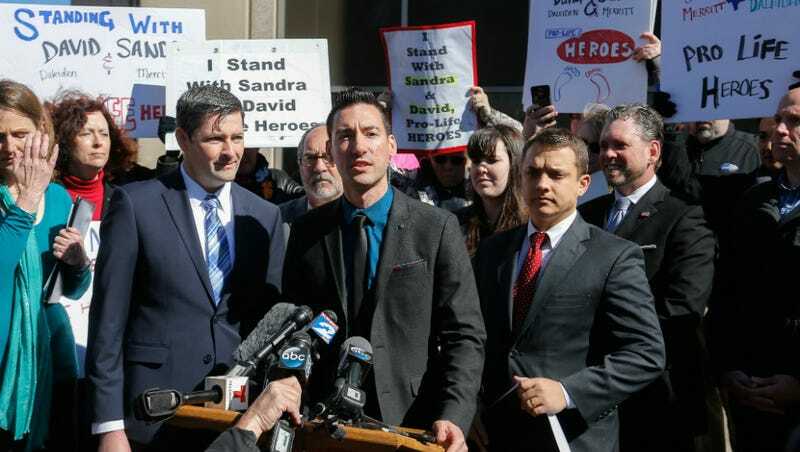 Investigators with the California Department of Justice searched the apartment of anti-abortion activist David Daleiden Tuesday night, seizing a laptop and hard drives, he told the Washington Post. Daleiden was indicted by a Texas grand jury earlier this year on fraud charges; the California raid indicates he is being investigated for possible criminal activity there as well. Daleiden told the Post’s Sandhya Somashekhar that the investigators took a laptop and several hard drives containing video footage, “including some very damning footage that has yet to be released to the public,” he told her. (Somashekhar published a flattering and very gentle profile of Daleiden in October). Today, the California Attorney General’s office of Kamala Harris, who was elected with tens of thousands of dollars from taxpayer-funded Planned Parenthood, seized all video footage showing Planned Parenthood’s criminal trade in aborted baby parts, in addition to my personal information. Ironically, while seizing my First Amendment work product, they ignored documents showing the illicit scheme between StemExpress and Planned Parenthood. This is no surprise—Planned Parenthood’s bought-and-paid-for AG has steadfastly refused to enforce the law against the baby body parts traffickers in our state, or even investigate them—while at the same time doing their bidding to harass and intimidate citizen journalists. We will pursue all remedies to vindicate our First Amendment rights. Harris’s office told several news outlets they won’t comment on an ongoing investigation.